I’ve talked about my skin a fair bit on here now, so many of you will be aware of my struggles with adult acne. It’s taken a while for my complexion to clear up, and although a healthier diet (with way less cheese, *sobs*) and a prescription treatment from the doctor have played a huge part in that, I also think that switching up my skincare routine has helped enormously. I feel like I’ve finally figured out what works for me (I may have said this before, but I mean it this time, I swear!) I still have the odd blemish but things are so much better, so I thought I’d share what I’ve been using. I start with Pixi Glow Mud Cleanser, £18. Oddly silky for a product that has ‘mud’ in the title, this cleanser leaves my skin looking brighter and feeling smoother without that horrible tight feeling. I pat my face dry with tissue, and follow with Kiko Eyes Rescue (which appears to have been discontinued because I can’t find it on the Kiko website at all. It’s a decent enough eye cream, I guess, but it’s not something I would have rushed out to repurchase). I moisturise with Superdrug Vitamin E Day Cream (v), which only costs £2.99 for a decent-sized tub, is often on offer, and lasts forever. The same can be said of a lot of products in the Vitamin E range so it’s definitely worth checking out, especially since everything is Leaping Bunny approved and suitable for vegans. This particular cream is moisturising but not too heavy for the morning, which means my oily forehead and dry chin take to it equally well, and it won’t irritate inflamed skin. Once that sinks in I prep my face with Kiko City Filter Sunscreen SPF 50 Primer, £12.90. This is especially important because the Pixi cleanser contains AHAs, which increase the skin’s sensitivity to sunlight. I normally faff around with my hair while the primer settles on my face and then I get going with the day’s make-up. A day without make-up is a rare thing for me so double cleansing is essential. If you’re a regular reader then you’ll know by now that my number one favourite skincare product is LUSH Ultrabland Facial Cleanser, from £7.50 for 45g. It is hands down the best cleanser I’ve found for removing make-up, melting everything away, and it’s very gentle on sore skin. Like a lot of balms, it’s quite oily but in my experience it doesn’t make oily patches worse. 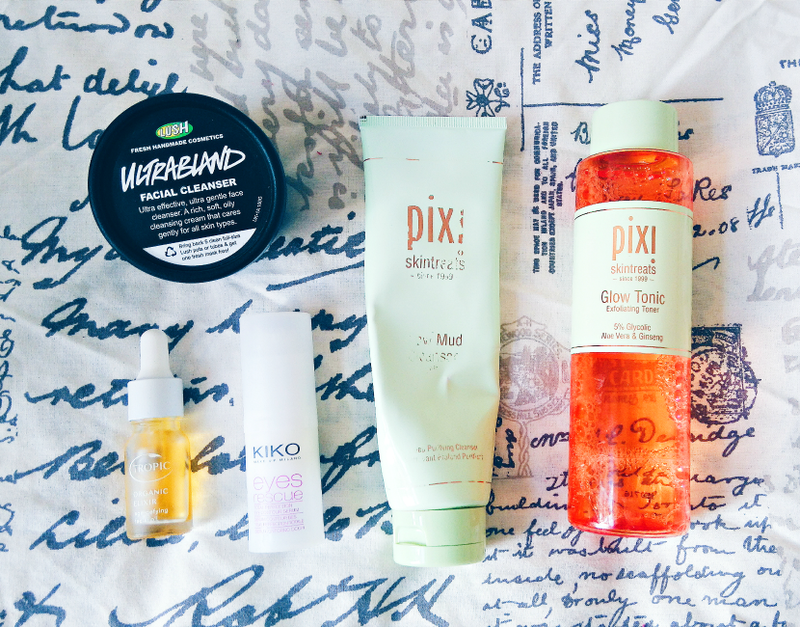 I then use the Pixi Glow Mud Cleanser as the second-cleanse, before wiping my face with a cotton-pad’s worth of Pixi Glow Tonic, £18. This is the only toner I’ve ever remembered to use day-in day-out, and it most definitely lives up to the considerable hype surrounding it — like the Glow Mud Cleanser, it makes skin smoother and brighter. 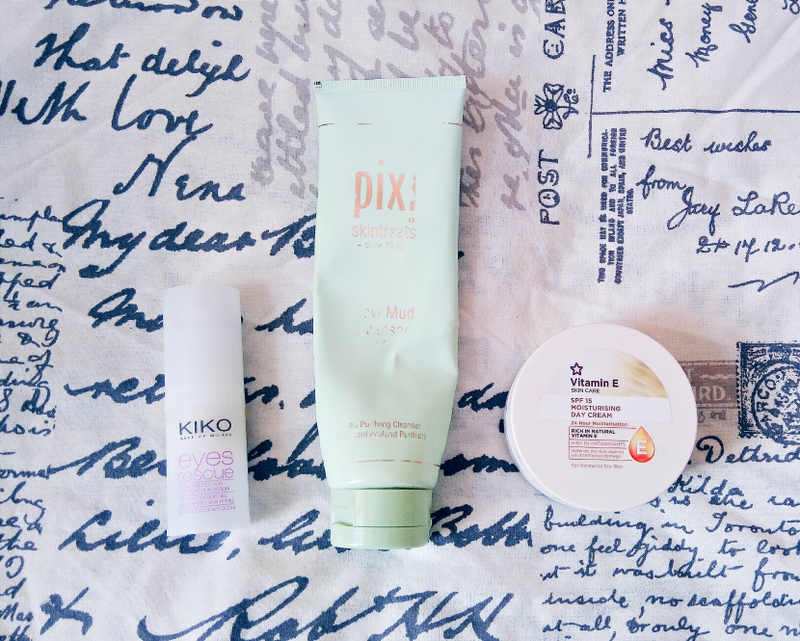 I apply Kiko Eyes Rescue again, and then pat a drop or two of the Tropic Organic Elixir* (v), £30 , into my skin. I had been using the Pai Rosehip BioRegenerate Oil (v), £22, but I ran out recently; the Tropic treatment arrived at a good time! If you get oily patches like me then the thought of using an oil can be a bit daunting, but my skin has been a lot happier since I started using oils in the evening. This particular one is lovely and light, leaves my skin nourished and hydrated, doesn’t upset any blemishes, and actually smells a teeny bit like marzipan? I’m not sure why, because the ingredients are kiwi seed oil, plum kernel oil, rosehip oil (♥), moringa oil, jojoba oil, pomegranate seed oil, and Vitamin E — no almonds in sight! Any ideas what it might be? What have you been using on your skin recently? Any recommendations? Let me know in the comments!